MAN CITY TICKETS SEASON 2018/2019 Manchester City Football Club is aiming for the Premier League title this year once again. The club with an unlimited budget have won the League Championship several times and the FA Cup as well. Their promotion to the Premier League in 2002 was immediately crowned with qualification for the 2003 UEFA Cup tournament, their first in 25 years. In 2011, Manchester City qualified for the UEFA Champions League and won the FA Cup against Stoke City. A year later, the Citizens finally won the Premiership, their first league title for 44 years. In 2014, they won the League Cup and a second Premier League title and on 28 February 2016 The Citizens won the Capital One Cup beating Liverpool on penalties at Wembley. Last season Manchester City finished 3rd in the league behind Leicester City, Arsenal and Spurs. With Pep Guardiola as their manager, they are a serious contender for the Premier League and the UEFA Champions League title this year. With world class players Aguero, De Bruyne, Sterling and Silva Man City seems unstoppable. Not only we have Manchester City tickets available for Premiership matches, but also we offer Manchester City Champions League 2018-2019 tickets, Manchester City Fa Cup tickets and Manchester City Capital One Cup tickets. All ticket orders are guaranteed. 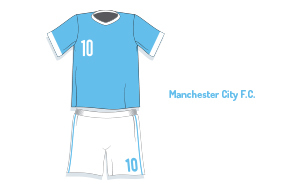 1st4 Football Tickets sells Premiership Manchester City tickets for home and away matches. See Manchester City playing at the amazing Etihad Stadium! You can buy your Manchester City football tickets online through our secure online booking system. Manchester City is the big favourite to win the Premiership title this season. Buy tickets now and see all your favorite players such as Aguero and Silva. Call our Manchester City Ticket Hotline for more Manchester City Football Tickets. Buy Manchester City home tickets and Manchester City away tickets securely online. Manchester City vs Chelsea Tickets - Manchester City vs Tottenham Tickets - Manchester City vs Manchester United Tickets - Manchester City vs Liverpool Tickets. Buy Manchester City tickets securely online now.